I’m beginning to think that all these airlines are trolling us. There’s no way that so much bad news can circulate at once, but alas, here we are again. 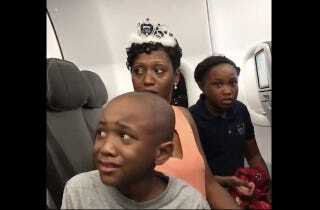 This time, a New Jersey family was kicked off a Las Vegas-bound JetBlue flight—delaying birthday-party plans and quite possibly leaving a bad taste in the family’s mouth—over a birthday cake. According to the New York Daily News, Cameron Burke; his wife, Minta; and their two children were flying from New York’s Kennedy Airport to Las Vegas on May 3, planning to meet family there for Minta’s 40th birthday party. The buttercream cake, from Tonnie’s Minis bakery, was included as part of their carry-on and placed in an overhead bin on the plane as the family took their seats in the last row of the plane. That was when a flight attendant approached the family with a request. And that was when trouble started. Another flight attendant approached the family just moments later, berating her colleague and then turning her ire on the Burke family. Another employee came up to the family and asked them to leave the flight. Burke refused, took out his cellphone and started recording. “But we moved it, we followed the directions,” his son adds between his tears. Eventually, two Port Authority officers were called to the plane. Burke said they did an investigation and found that there was nothing wrong. An officer can be seen on the video assuring the family that they had done nothing wrong. “We were just so happy. Couldn’t wait to get to Las Vegas, and all of a sudden this occurred, and my two children are screaming, crying. They’re confused, not knowing what’s going on—they were traumatized,” Minta Burke said, according to People magazine. JetBlue then made everyone leave the full flight in order to get the Burke family off. The family’s tickets and reward points were refunded, and then, Burke says, his family was ordered to leave the JetBlue area. The family’s luggage still went to Las Vegas and was collected by a family member. JetBlue, however, insists that the issue lies with the Burke family for storing the cake in a compartment designated for emergency and safety equipment. The airline accuses the family of refusing several requests to move the cake. According to the report, the flight’s captain decided to remove the family and allowed all other passengers to reboard. Burke managed to book a United Airlines flight from Newark, N.J., the next day but says he is still planning to file a lawsuit against JetBlue.